I love it when I meet someone with a passion for knives and using them in their hobby. You know it when you meet one of these people cause you can see the twinkle in their eyes as they describe their knife related area or craft. Had the opportunity recently to meet a 20 year master craftsman whose use of knives is integral to his bringing wood to life. Meet Allen Goodman at his YouTube Channel. CarvingVideos.com‘s interview with this master caricature carver. 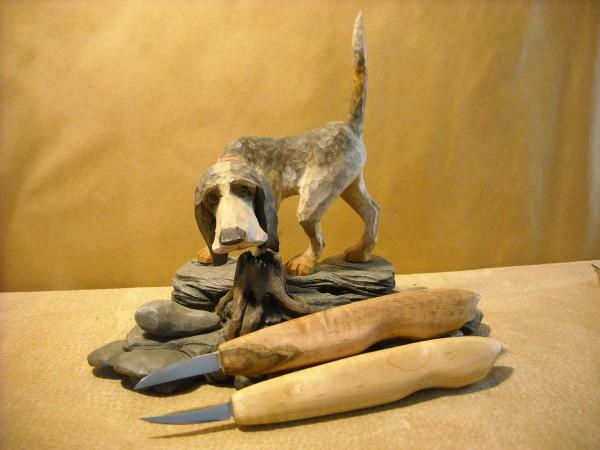 After you’ve met him, check out some of his carving knives and finished products. Talked to you when you were at smokey moutain woodcarvers. Enjoy your work and would like to know if you have a shop and how to order one of your knives. Do you give lessons and cost. Thanks Cutlery News Journal, Its an honor to be on your awesome site ! Thanks for shinin’ a little light on another who shares a fascination with knives of all kinds,shapes & sizes. Keep up the great work !